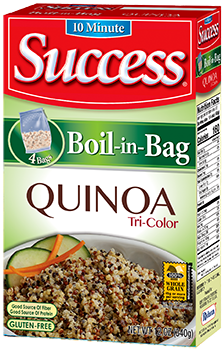 Success® Quinoa (keen-wa) is the newest product from Success® and the only national brand offering tri-colored quinoa in a convenient boil-in-bag. With a 10-minute cooking time, Success® Quinoa is light and fluffy with a nutty flavor. Plus it’s a good source of fiber and folic acid. This quick and versatile product from Peru is also a complete protein, containing all nine essential amino acids in its blend of white, red and black quinoa. Success® Quinoa offers recipe versatility so try it for every meal occasion from breakfast to dessert. 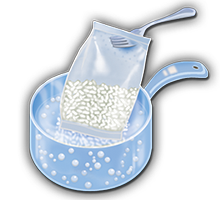 Boost the flavor by cooking the boil-in-bag in fruit juice, broth or milk to create sweet, savory and healthy dishes your whole family will enjoy. Let’s get cooking!! Each bag makes about 1 1/2 cups. Pour about 4 cups (1 quart) water into medium saucepan and submerge 1 bag of quinoa (use about 2 quarts of water for two bags). Bring water to a boil and boil 10 minutes. Remove bag from water with fork and drain. Cut bag open and empty quinoa into serving dish. Add salt and butter, if desired. 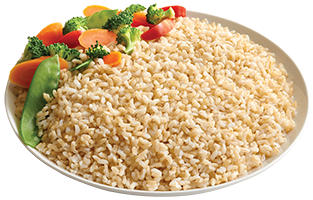 In a 2-quart microwave-safe bowl, submerge 1 bag of quinoa in about 4 cups (1 quart) water. Cover and microwave on HIGH 15 minutes. Remove bag from water with fork and drain. Cut open bag open and empty quinoa into a serving dish. Add salt and butter, if desired. 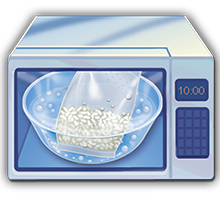 Microwave ovens vary. Cooking times are approximate. We do not recommend using the microwave to cook multiple bags. 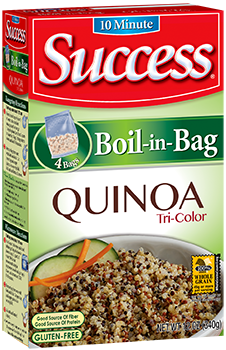 To prepare Success® Quinoa "out-of-the-bag", click here for more information.